On International Women’s Day, I attended the 2017 Catalyst Awards dinner in New York City, where for the second time in three years, a long-standing WMFDP client received the coveted Catalyst Award. Rockwell Automation (RA) was honored for their 10-year Culture of Inclusion Journey. During this period, over 8,000 leaders and managers have been impacted by our programs and learning experiences. These courageous and influential leaders changed how they and their colleagues work and partner across difference; how they recruit, promote, and retain talent; and how they see their leadership roles. Witnessing and celebrating Rockwell Automation’s accomplishment was a proud and humbling moment for all of us at WMFDP. It was gratifying to see Rockwell Automation (RA) honored for their commitment to raise consciousness, strengthen confidence, and build cultural competency within their leadership –and all across Rockwell Automation. Their courage to address culture change and to look specifically at the intersection of power, privilege, group identity, culture and personal behavior has resulted in a significant shift in gender representation. Listening to the words of RA leaders in attendance it is clear they fully understand the challenges and complexities of creating and sustaining a culture of full inclusion. To their credit, they realize the work is challenging, never-ending, and they are committed to sustaining their diversity journey. Another longstanding client, Lockheed Martin, received the Catalyst Award in 2014 for their US-based initiative Women Accelerating Tomorrow – a variety of programs, processes, and tools to support women’s advancement as part of a broad strategic effort to attract, develop, and retain diverse talent in a highly technical and engineering-focused industry. What do Rockwell Automation and Lockheed Martin have in common? Companies often ask us how can they engage their leaders, especially white male leaders, so that workplace equity issues become everyone’s issue. 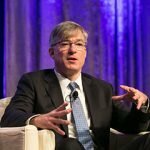 The sustained work that Rockwell Automation and Lockheed Martin have done over the last decade point to the fact that shifting one’s workplace culture, which begins with head and heart leadership, is a concerted effort requiring years of commitment –not a limited problem-solving initiative. Did these two clients commit to 10-years of work from the beginning? Hardly. 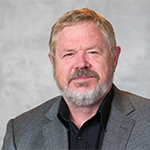 But as they witnessed the undeniable change in their leaders, and the positive impact it had on workplace partnership and productivity, they moved organically toward a commitment to continually engage and challenge individuals, teams, and the organization. This year WMFDP celebrates its 20th anniversary. More important, we celebrate our clients. The pride we draw is not about the anniversary itself, but rather about 20 years of partnership with committed companies and courageous leaders and seeing the difference they have made. Two decades ago, we developed a transformative learning experience for white male leaders because we saw then, and see to this day, that when white men are disengaged from D&I efforts, their organization’s success is marginal, and usually does not impact the cultural fabric of everyday corporate life. 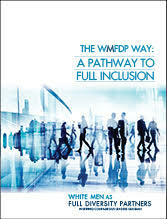 Our non-traditional and experiential approach to diversity and inclusion –The WMFDP Way, Pathways To Full Inclusion– has shown that when engaged white men and women, along with people of color redefine and strengthen work partnerships, they can move on to address real business challenges tied to bottom line success. Our work has repeatedly shown us that white male leaders, when empowered, can be vital and vocal change agents to create and sustain inclusive work cultures. Over 20 years of work strongly suggest that companies will not succeed in moving the representation equity needle without white male leadership engagement. Partnering with our clients, we help remove the barriers that prevent real and inclusive dialogue from becoming normal and commonplace.